The Nevada national security site is littered with bomb blast craters, but there are also holes that were drilled but never used and these holes can now be used to gain access to the subsurface. Hundreds of millions of miles away on Mars, NASA's Curiosity rover is looking for clues that a suitable environment for life might once have existed on our desolate neighboring planet. Curiosity can only scratch the surface, since its drill penetrates mere centimeters below the ground. Even if the rover's scientific instruments were capable of directly detecting microbial life, any evidence of past or present life is likely hidden deep within the subsurface, many scientists say. Future missions to Mars will need the right equipment to detect and study any subsurface microbial life, but such equipment will need to be perfected on our own planet first. A large chunk of Earth's biomass is locked up underground, both in the oceanic subsurface and in the terrestrial subsurface, and Amend will be turning his efforts towards the latter. The first part of the mission will be to gain access to the subsurface, and there are already many potential boreholes lined up. It is easier to take advantage of preexisting boreholes, known as legacy boreholes, and the scientists have access to some potentially interesting sites. 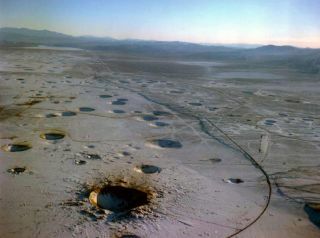 The Nevada national security site is littered with over 800 bomb blast craters, but it also has holes that were drilled and never used. These can now be used as a window to the subsurface. Amend and his team are also hopeful that they will be able to use mines as a starting point for boreholes, although this is still a number of years away. Another option is to have nature bring the sample up from the subsurface, in the form of deeply sourced springs. While experiments can't be lowered down these springs, the fluids bubbling up from the depths can still be studied. Shewanella oneidensis, which "breathes" iron, is an example of a microbe that uses extracellular electron transfer. Once beneath the surface, the next item on the agenda is to detect and characterize any microbial life in its natural habitat. To do this, the team will be using deep ultraviolet microscopy both within the borehole and in the lab. The instrument that takes the journey down the borehole is the Subsurface Exploration and Assessment of Life (SEAL) microscope. SEAL can detect microbes on site, and it is already in use in marine subsurface studies. Using deep ultraviolet microscopy has big advantages. The technique is non-invasive, so that the sample remains perfectly intact, and no direct contact is needed with the sample. The next goal is cultivation of the microbes. "The idea of cultivation has taken a backseat in microbiology for a long time, and we're bringing culturing back, so to speak," Amend said. "Our approach to this is to use a variety of different cultivation techniques to try to cultivate some of those difficult-to-culture organisms." Amend maintains that many microbes are just uncultured, rather than unculturable. They have several novel methods with which to do this. Using a "down-flow hanging sponge bioreactor" enables them to study organisms that grow very slowly, as well as organisms that live in environments with slow fluid delivery. "This system allows us to control a very slow delivery of nutrients and fluids," Amend explained. "The sponges have a very high surface area, and it is a very porous environment, so the organism can attach to the surface and create a microenvironment." The system can be operated over a range of temperatures and it can also be kept anaerobic if necessary, he added. A gradient diffusion chamber creates a natural gradient by having an electron acceptor, called the oxidant, at one end of the chamber and an electron donor, called the reductant, at the other. Amend likens it to food and air for humans. "So you're not saying, 'I wonder if these organisms can grow in these conditions,'" he said. "You're establishing a gradient of conditions and letting the organism tell you where it wants to be." The organism can then be removed from the chamber for further study. On-chip cultivations take advantage of the fact that some microorganisms are capable of transferring electrons outside of their cells, a process known as extracellular electron transfer. In this experimental setup, electrodes are used as the oxidant or the reductant. "For us, oxygen in the air is of course the oxidant, so we dump electrons from the food we eat on to oxygen," Amend told the audience. "[In on-chip cultivation], the organisms can dump electrons on to the electrodes, or they can use the electrodes as the electron donor." The electrodes can be fine-tuned so that different types of organisms can be grown. In some cases, organisms can't be grown on the electrodes, but it’s still possible to look at the current produced by a single cell. Chemostats, which are continuously stirred tank reactors, are also used. "It's quite simple in concept, but difficult to operate," Amend said. Chemostats have a large volume, and different environments can be created within the reactors according to the organisms being studied. Jan Amend, professor of earth sciences and biological sciences in USC Dornsife, leads an interdisciplinary team of researchers in an investigation into what life teems within Earth's subsurface biosphere. Their approach could become a template for collecting evidence of life or past life on extraterrestrial planetary bodies such as Mars. The third part of the project leans more towards the theoretical side, as the researchers plan to create a global map of subsurface metabolisms. This has already been done using the example of an organism in the vicinity of a hydrothermal vent. It is possible to pinpoint the depth in the sediment and the distance from the vent at which the organism would get the most energy. This can be done by mapping the concentrations of elements needed for the chemical reaction that the organism uses for energy. Amend also plans on running what he calls "competition experiments," by using an organism that has the chemical ability to perform two different types of reactions. For example, methanogens are microbes that can form methane in two different ways depending on the conditions. The aim of the experiment is to place the organism at a temperature and energy where it could implement either reaction and see what happens. Another envisioned experiment is to change the energy to see if the organism can switch metabolism, i.e. switch from one type of reaction to the other. Implementing all of these novel techniques over the next five years should ultimately lead to a better understanding of the microbes that call the deep subsurface home. Perfecting these techniques on Earth also has the potential to yield exciting discoveries for future missions exploring other terrestrial planets, researchers said.